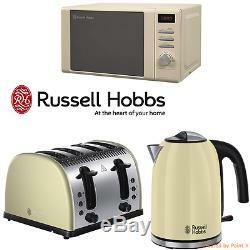 Cream Russell Hobbs Stainless Steel Microwave Kettle 4 Slice Toaster Kitchen Set. Looking for a matching colour microwave, kettle toaster set or other matching colour appliances for your kitchen? You're in right place, we're also creating custom appliances sets for your requirements. And we'll answer you within 2 hours or choose colour or style below to see our full range of microwave kettle & toaster sets or other coloured kitchen appliance sets. Russell Hobbs RHM2064C Digital Microwave, 20 Litre - Cream. The Russell Hobbs RHM2064 microwave has a sleek and stylish contemporary design, boasting an attractive mirror door finish. As well as an appealing look, this appliance also includes impressive functionality, with 800 watts of microwave power providing quick and convenient cooking in your home. The RHM2064 from Russell Hobbs is a 20 litre cavity capacity microwave, comfortably fitting a standard size of dinner plate. It comes with a removable and dishwasher safe glass turn-table for easy cleaning. Pre-programmed auto cook menus, such as pizza (reheat), fish, and popcorn, allow you to cook all your favourite foods at the push of a button. Whats more, theres automatic defrost settings meaning all you have to do is input the weight of the food, and the microwave selects the ideal defrost time, saving you time and effort. Moreover, 5 microwave power levels enable tailoring of your cooking experience. Additional features include a handy digital clock and pre-set function, and for added peace of mind, the RHM2064 comes with a child safety lock option, preventing young children from being able to open the microwave door. 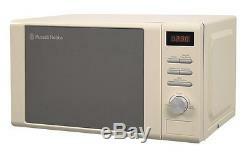 1 x Russell Hobbs Microwave. 1 x Microwave Turn Table. 1 x Microwave Turn Table Ring. 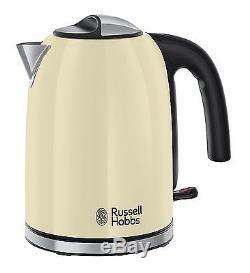 Russell Hobbs 20415 Colours Plus Kettle, 3000 W, 1.7 Litre, Cream. Rapid boil zone feature - You can boil 1 cup in 45 seconds by boiling 1 cup (250ml) vs. Pull to open hinged lid. Russell Hobbs 20415 Colours Plus Kettle, 1.7L, 3000W - Cream Rapid boil zone feature - You can boil 1 cup in 45 seconds by boiling 1 cup (250ml) vs. 1.7 litres 1.7L capacity Pull to open hinged lid Side water gauge. 1 x Russell Hobbs Colours Plus Cream Kettle. Russell Hobbs 21302 Legacy 4 Slice Toaster - Cream. Cream stainless steel toaster with Russell Hobbs logo embossed. Wide slots - ideal for crumpets, tea cakes and thick slices of bread. Independent two and four slice operation. RUSSELL HOBBS LEGACY CREAM TOASTER. 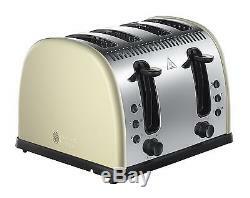 1 x 21302 Legacy cream 4 slice toaster. ALL ITEMS SENT DIRECTLY FROM APPROVED 3rd PARTY SUPPLIERS. These items may be dispatched directly to you from a third party distributor. You must have a confirmed address. This allows our products to remain very competitively priced. Please note, bundled items may arrive separately and on different days because we may use different suppliers. We request you to try your new item/s as soon as you receive them. If the item in your opinion doesn't correspond to pictures and/or descriptions, you MUST inform us within 24 hours after the item has been received; failure to do so may result in us (on our supplier's behalf) not granting you the return. If you changed your mind about the item, but nothing is wrong with the item itself e.
It works properly and perfectly corresponds to pictures and descriptions, we (on our supplier's behalf) may not grant you the return. Check out my other listings. The item "Cream Russell Hobbs Stainless Steel Microwave Kettle 4 Slice Toaster Kitchen Set" is in sale since Tuesday, May 24, 2016. This item is in the category "Home, Furniture & DIY\Appliances\Coffee, Tea & Espresso Making\Kettle & Toaster Sets". The seller is "*microwave-kettle-toaster-sets*" and is located in London.